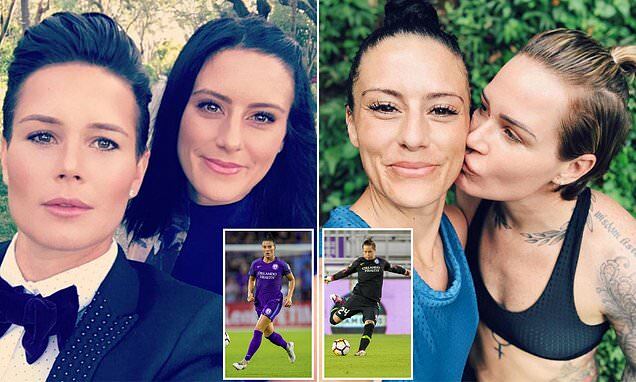 World Cup champions and National Women's Soccer League stars Ali Krieger and Ashlyn Harris have announced their engagement after almost nine years of dating. The romance between Ali, 34, and Ashlyn, 33, started after they first met in 2010 while playing alongside each other for the U.S. Women's National Team, however they revealed that they chose to keep their relationship as private as possible so as to retain their professionalism. 'We became really close friends, and we just hung out, we clicked, and we had so much in common,' Ashlyn told People, while speaking about their engagement. While on a weekend getaway together at Clearwater Beach in Florida, Ashlyn surprised Ali by proposing with a ring after the couple took a selfie together during the sunset. 'It was a really good time because I felt really on the same page with her, and really excited about our future and talking about our future plans with kids, and family, and things like that,' Ali said about her relationship with Ashlyn. The proposal came just after the couple had finished a picnic on the rocks of the beach.